This romantic country inn sits at the end of an unwinding road, nestled into a hill surrounded by flower gardens, wooded trails, and a spectacular mountain view of the Presidential Mountains, including regal Mt. Washington! 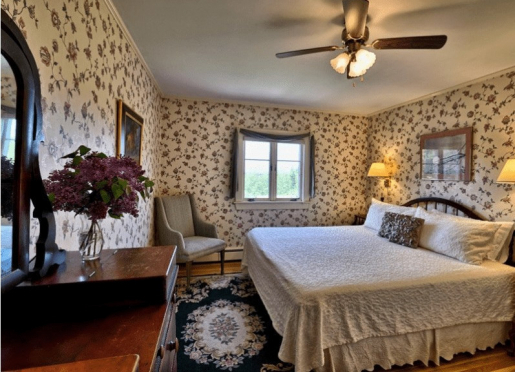 Situated close to both North Conway attractions and the White Mountain National Forest, The Darby Field Inn continues to delight travelers adventurous enough to wander off the beaten path. 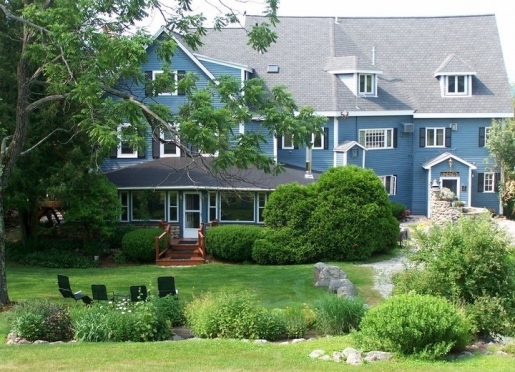 It is a New Hampshire wedding location, offering Elopement and Intimate Wedding packages that celebrate your special day! 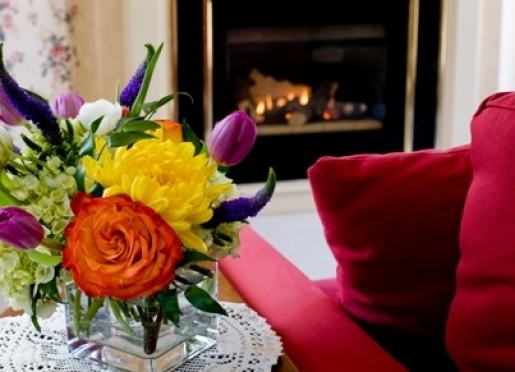 Try our Romance Package for a truly special getaway. 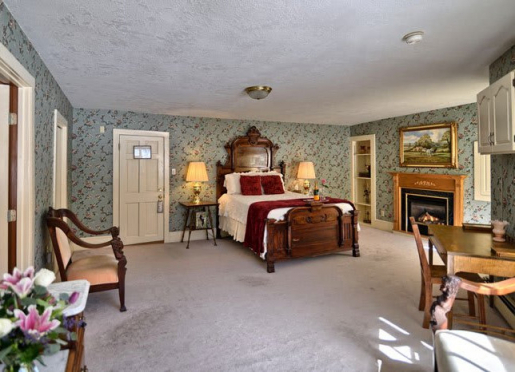 Whatever your reason for visiting, the Darby Field Inn offers something for everyone. In fact, once you get here, we bet you'll find many reasons to return! Travelers are always looking for memorable and relaxing experiences. Let’s discover more through the words of our innkeepers. Many thanks to Marc and Maria Donaldson for sharing their own secrets with BBOnline.com! Our amazing view is a big draw! Our northern view of South Moat with Mt. Washington and the presidentials in the background is incredible! Guests love our unique rooms; many stay in a different one each visit to find their favorite! Of course, our food is delicious, and our staff is the friendliest! This area is a long time favorite for outdoor activities: skiing, biking, hiking, swimming, canoeing, snowshoeing, and snowmobiling. There is also shopping – great deals to be found at Settler’s Green Outlet Mall, and unique stores in North Conway and Jackson Villages. Guests don’t want to leave, and can’t wait to come back! The Darby Field Inn and Restaurant! Some favorites are: drive the Auto Road or take the Cog Railway up Mt. Washington, Explore North Conway or Jackson Village, shop for deals at Settler’s Green Outlet Village, drive or cruise (on the MS Mt. Washington) around Lake Winnipesaukee, canoe or kayak down the Saco River, ski or tube at one of the local mountains, see the sights on the Kancamagus Highway, go ice skating at Ham Arena…and more! There are so many activities to choose from. We have over two miles of onsite wooded trails, plus Tin Mt. Conservation Center is nearby, and they offer an additional 5 miles of nature trails. Swift River is right down the road for trout fishing. We recommend our own restaurant first, because what's better than staying in after a busy day? Then we nearby comparable restaurants: Snow Village Inn in Eaton, NH, and Oxford House in Fryeburg, ME. 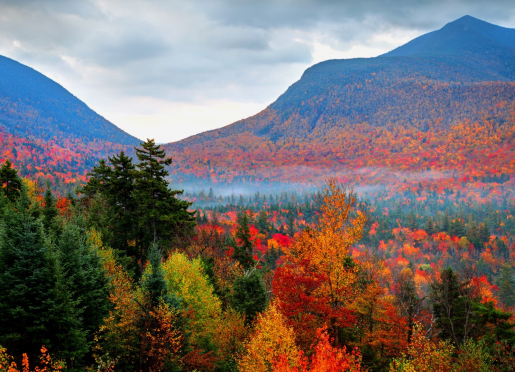 The Mt Washington Chamber of Commerce website, Visit White Mountains website, and White Mountains National Forest website. 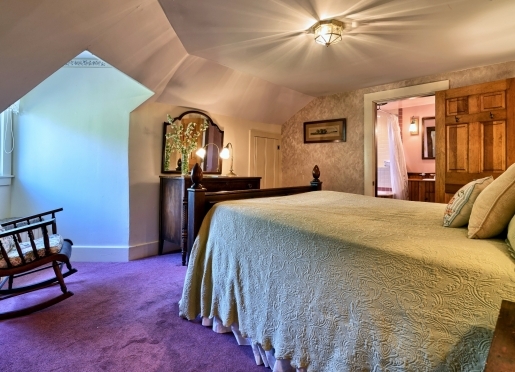 We have 13 unique rooms, all with private baths; 7 economy rooms, 6 deluxe rooms/suites. Unfortunately, we do not accept pets. We recommend Karla’s Pet Rendezvous here in Albany for boarding. They really pamper your pet! We invite you to savor our delicious food in either our romantic mountain-view dining room, or in cozy Littlefield's Tavern. 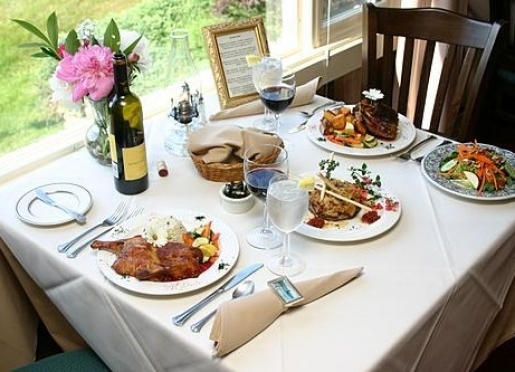 No matter which you choose, You will find dining at the Darby Field Inn is more than a meal, it’s a delight! The Darby Field Inn has been bringing culinary excellence to the Mt. Washington Valley for 32 years. From our made to order country breakfasts to our candlelit dinners, we are always striving to serve our guests in the style and manner that only a true country inn could provide. 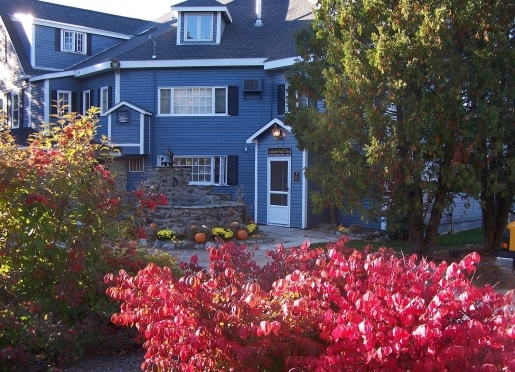 The Darby Field Inn features a full service restaurant for the dining pleasure of our guests. Dinner is served from 3 to 5 nights a week. Our restaurant hours change seasonally; please inquire about dinner when making your reservation. The 'Inn soup' - Fresh, perfectly seasoned and prepared fromonly the freshest ingredients. Bourbon Bacon Shrimp - Bacon wrapped shrimp baked in a bourbon sauce. All dinners include fresh rolls, seasonal vegetables, and choice of potato or rice. Filet Mignon – Wrapped in bacon and grilled to your liking; served with melted bleu cheese. Roast Duckling – A half duckling, roasted crisp, and accompanied by our homemade raspberry sauce. White Mountain Chicken - Boneless breast filled with our cheddar/apple stuffing and baked; finished with an apple/maple cream sauce. The Irish Revolution - A unique blend of O'Darby's Irish Cream, Irish Mist, Jameson's Irish Whiskey and ice cream. An interesting alternative to the molotov cocktail. Creme Celeste - An eggless sour cream custard with a hint of orange Cointreau; served with a raspberry puree. French Apple Pie - Lovingly baked with fresh apples & topped with a brown sugar crumb topping. Chocolate Pate - A moist flourless chocolate cake sliced and served warm with a white chocolate sauce. 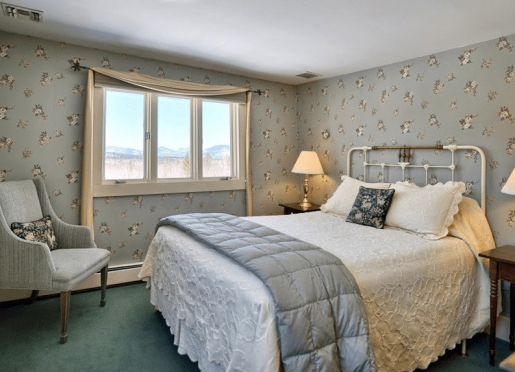 Our Romantic country inn is located off the beaten path overlooking a breathtaking view of the Presidential Mountains of New Hampshire! It offers the perfect setting for intimate celebrations of up to 50 indoors and 70 outdoors. No matter what your wedding plans are, our friendly, professional staff is dedicated to making your wedding day all you imagined...and MORE! An experience you will cherish for a lifetime! Feel free to call or email to check availability and rates for your celebration. An initial deposit is required to reserve your date(s). Every wedding is unique: rehearsal dinner, social hour, reception dinner, and beverages are additional charges based upon bride and groom selections. 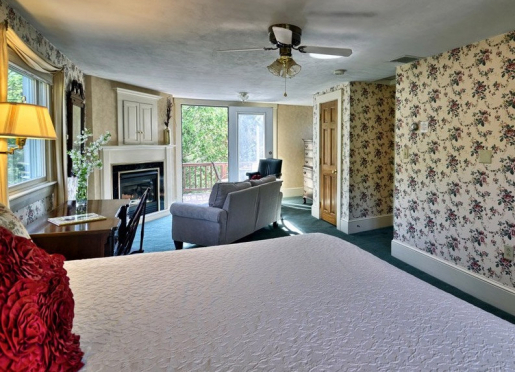 The Inn can accommodate up to 26 overnight guests in 13 rooms/suites, all with private baths. We can recommend other nearby B&Bs or hotels for additional guests. We are able to serve up to 50 guests in our dining room, and up to 70 guests among our flower gardens, with the rental of tent, tables, and chairs. We are delighted to answer your questions and share your ideas! Additional wedding information is available upon request. Big weddings aren't for everyone. For those of you who prefer a quieter affair, we offer an Elopement Package for two, and options for small weddings (no more than 20 people). Our innkeeper, Marc Donaldson, is a justice of the peace and can marry you in the spot of your choosing on the property - in front of a crackling fire in our living room fireplace, among the flowers in our award winning gardens, on our mountain view patio, on the knoll overlooking the Inn and White Mountains beyond - the only limit is your imagination! Add a relaxing couples massage before your ceremony, or other items from our Special Touches Menu to make your stay even more romantic! After your wedding, toast to your success with a split of champagne or bottle of sparkling cider,or invite your guests to join you for dinner. Our dinner menu offers a little of everything, from bacon wrapped filet mignon to vegetarian entrees! Exceptions: Add $50 during peak seasons (holidays and fall foliage). Invite guests: Add $50 for up to 10 guests, $100 for up to 20 guests. Food and beverages are an additional charge. Accommodations: Laura and Samuel's Rooms, Shackford, and Littlefield Suites. Restaurant hours and days of operation change seasonally...please ask when booking a midweek elopement if dinner will be available. There's Always Something to Do at the Darby Field Inn! It is a full service inn complete with thirteen rooms and suites, some of which have a fireplace and Jacuzzi, on-site massage services, WIFI, and a menu of special touches and packages to make your visit memorable. It is an escape from the ordinary, offering dinner by lamplight in our mountain-view dining room, an International wine list, and your favorite beverages - including New Hampshire beers, mead, and wines - in Littlefield's Tavern. It is a comfortable hideaway for those looking to relax by the fireplace in the living room, on the patio with its stunning Mount Washington view, in a hammock overlooking our splendid flower gardens, or by the crystal clear heated outdoor swimming pool. 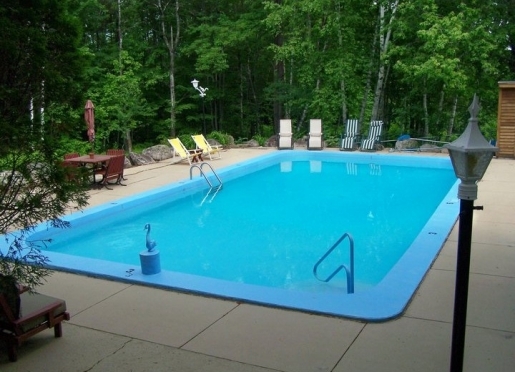 It is a White Mountain retreat, surrounded by natural beauty and outdoor activities. Located just minutes from the National Park, our knowledgeable staff can recommend local hikes for every ability level. Why not start with our on-site wooded nature trails? They are perfect for snowshoeing, biking, or just walking off breakfast! Thank you Marc, Carol, and all who organized the lovely wedding for Lisa and Kenny. Everything was perfect, well except for the humidity, but at least it didn't rain. Everyone loved the place, food, wait staff, the room, the air-conditioning, the flowers and the ceremony was lovely. Thank you so much! We will be stopping in for dinner in the pub or dining room. Kenny and Lisa were so happy. Brenda and I would like to add to your comments page what an incredible stay we had with you at Darby Field. Your website and actual location are well matched. We enjoyed our stay immensely. The room was eloquent, view gorgeous, food - unbelievably good, and you make a great pina colada!! :) Everyone on the staff was friendly and helpful. Our stay was a pleasantly memorable one. 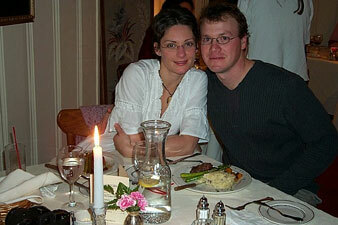 Hi Marc...it has been 15 years since I had my wedding at your incredible Inn. It was without a doubt the most memorable time of my life next to the birth of my two sons. I still remember the fun we had with your staff...especially Waneeta...and your family! Just showed my youngest your website after watching a movie mentioning Nashua. I would recommend (and have) to all of my friends. I wish you continued success and hope to be out there again in the near future. A nice getaway for our anniversary! Great people...great place! We had a wonderful time...can't wait for spring/summer to come back and visit our new Friends! Thank you so much for your wonderful flexibility and hospitality! This was a dream engagement and you all helped to make it happen! So excited to come back for many anniversaries to come...everything was perfect! It is not often you can stay in a place that brings such comfort as home. This has been a beautiful stay for us...thanks to all of you. We shall remember our stay here and speak of it often to our friends! The first day of a new decade. Very romantic weekend to celebrate our 25th. The sleigh ride complete with lightly falling snow made it more than perfect! Wow!! This has been such a phenomenal few days we hate to leave. Your kindness and hospitality are unmatched...we can't wait to come back! Thanks for fulfilling my lifetime dream! Forget the Olive Garden...When you're HERE you are family! Thank you for such an awesome place to stay and all your hospitality! This was a dream come true wedding. Everyone made it so special for us. We will be back for years to come! This was the best part of our vacation! We had a great time and hope to come back again. Thank you very much for the wonderful hospitality and the amazing cuisine as we celebrated our wedding at the Darby Field Inn. Coming back home to visit New Hampshire was beautiful because of my stay here...what a lovely place! Fabulous birthday for our mother, grandmother, sister and daughter!! We have been coming here for 10 years and love this place like no other! Thanks for everything...can't wait 'til the next trip. Hope to find everyone happy and healthy. This place is the definition of charm; a peaceful, lovely, and picturesque setting, with attentive, friendly hosts - with excellent fare! From the website initial overview to the end of the stay, all expectations were exceeded. Thank you for a wonderful stay, martinis, dinner and breakfast. We will look for every excuse to head back this way! Thanks again...this is our fourth visit. This time we got engaged and it was wonderful! Another weekend of warmth, romance and hospitality which has become the signature of this wonderful place in nature. Thank you for your kindness & sharing a part of your home & memories with us. We'll be back! What a wonderful hideaway! A jewel in the mountains... Our stay was very special and we heartily recommend the Darby Filed Inn. Special thanks to Marc & Waneeta who went out of their way to make us feel like family! We had a wonderful time. The staff is so warm and friendly. The accommodations wonderful, the food fabulous and the scenery breathtaking! Thanks for a wonderful vacation. What a great way to start our New Year!! Here we are again a year later and brought some friends with us. Everyone was GREAT!! The same friendly, accommodating staff. We met some interesting people from all over and our stay was fabulous! We had a magical time from when we first came in the door to when we left. The people, the ambiance, the food - everything was just perfect! We are so glad we got married here! Thank you for comfort, great food, relaxing atmosphere, new friendships and most of all the warm hospitality...I'm sure we'll return to this wonderful Inn! Laughing, looking, celebrating sisters. Thanks for opening up and letting us be! Everyone on staff added to our adventure! The most romantic place I've ever been to in my life! Second time here with the family, the third time will have to be with a beau. 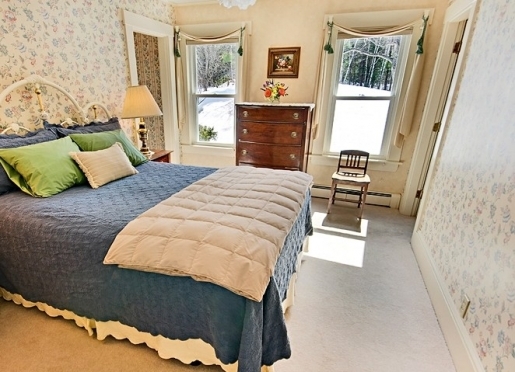 Beautiful rooms, cozy environment, incredible food and hospitality...right smack in the middle of a winter wonderland! The sleigh ride was awesome, the food was great and all the staff here are wonderful! Thanks for making our night so enjoyable! Oh, how we hate to leave!! Thank you for helping us celebrate Erik's 50th Birthday. There's no place we'd rather be. Thanks for the great stay! Everything was top notch here. Keep up the good work & keep the same friendly staff forever!! We had a great time! Really loved the blue jays and cardinals outside the dining room window. Cross country skiing was fun for the first time...fell only a few times! Thank you for a quaint, out of the way stay. The wait staff was wonderful & personable. The pancakes heavenly along with the rest of the food. The views were breathtaking. It was the pick me up we desperately needed. Thanks so much for a great weekend. It was relaxing and around every corner another smiling face waiting to make our stay even more relaxing. We were even treated to a romantic dinner in front of the fireplace! How romantic is that? We will be seeing you next year! The scenery was also beautiful; the sleigh ride magical and snowshoeing was wonderful. Thank you for the awesome time we had here. It is beautiful, peaceful and relaxing. Everyone is so nice, warm and welcoming. It felt just like home. We especially loved the sleigh ride and the beautiful horses your neighbor has. It is truly a piece of heaven! It was our first time staying at the inn but, our 3rd time on the sleigh ride. We are celebrating our 1 year wedding anniversary. All was fabulous; atmosphere is spectacular and the food delicious. We will definitely be back! A visit to New Hampshire would not be complete without a sleigh ride, and the best dinner in N.H.! See you again soon! This has been a dream fulfilled! The sleigh ride was grand, the room fantastic, the meals wonderful! Thank you for a great weekend away. The atmosphere was welcoming - loved the fireplaces. 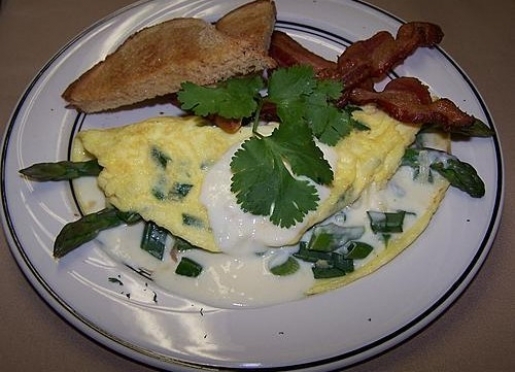 Great breakfasts, friendly staff, a wonderful weekend! Stay in the left lane as you approach Portsmouth, NH. Turn onto Rt.16 N/SPAULDING TURNPIKE. Continue to follow RT-16 N (toll road) (75 miles). 1/2 mile before Conway (shortly after Profile Subaru and RV) turn left at Darby sign onto Bald Hill Rd. (1 mile). Turn right at the Darby sign onto Chase Hill Rd (0.9 miles). Take EXIT 23 onto Rt. 104 E toward MEREDITH (8.6 miles). Turn LEFT onto Rt. 3 (0.8 miles). Turn right onto Rt. 25 E (approx. 25 miles). Turn LEFT onto RT-16 N (approx. 20.0 miles). 1/2 mile before Conway (shortly after Profile Subaru and RV) turn left at Darby sign onto Bald Hill Rd. (1.0 mile). Turn right at the Darby sign onto Chase Hill Rd. (0.9 miles).